fashion whirled: Bugle Boy Blast from the Past! Bugle Boy Blast from the Past! Look what Rachel Spevak, former DNR colleague and fellow stripe-meister of mine, brought to the menswear party last night! Initially, I couldn't figure out where we were (or what were we thinking?!). Rachel had marked the photo on the back June 1987. Whoa! I thought it was one of the grand parties out in Vegas during Magic, but the timing was wrong. The more I looked, I see we're standing in front of a boat and then it came to me. East 23rd Street Boat Landing, a Bugle Boy event during Young Men's Market on a party boat. Obviously, the dress called for "nautical" that night! Note our identical striped mock neck big shirts, my matching messenger bag, ankle socks, leather fisherman sandals and, in a prior-to-when-she-was-born shout-out to The Man Repeller, "birth-control glasses" from back in the day. 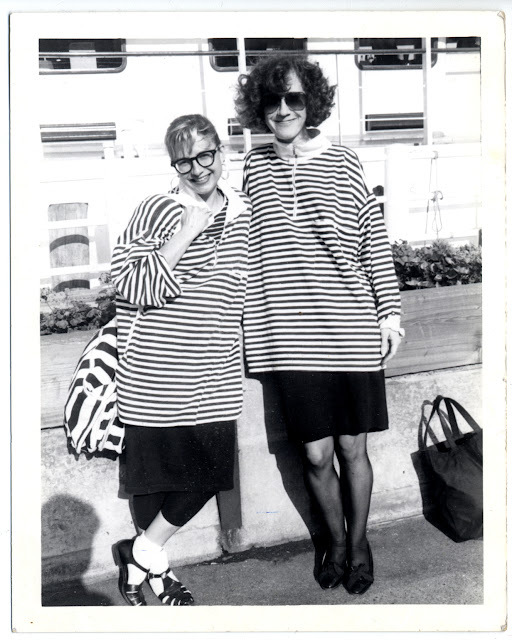 The winner gets kudos for their fashion stripes! It's killing me that I can't remember who made that shirt. Could it have been Mexx? THAT IS AWESOME!! Good job, Rachel! :) My shot-in-the-dark guess would be Canal Jeans. It was the cool beans place to be back in the day, right? Mexx is a good one, Rach. I am still thinkin' Canal Jeans, too, Catherine. Although I had another friend who threw out Charivari and Pat Fields, which were too rich for my taste back then, and Domsey Warehouse, which, for some reason unbeknownst to me, I never got a crack at!